Knog scores high on the compact and convenient rating with its Blinder Mini Chippy Twinpack. Both the front and rear are super-easy to fix to the bike, give out sufficient light to make your presence known to other road users, are fully waterproof, and charge directly from a USB port – no cables required! The light casings are identical in design: sealed units housing surface mounted COB (Chips on Board) LEDs behind a reflective face. Each has an integrated USB plug for recharging, and Knog is clear about it being designed to withstand exposure to the elements. The mounting system consists of a choice of different size detachable silicone straps (three for the rear, two for the front), which accommodate standard and oversize handlebars and seatposts, even aero ones. First you attach the strap to a clasp, and then to the light, which is the fiddliest part; once done you'll rarely have to change it – unless you're regularly swapping between drastically different diameter bars/posts. The lights have a notch to ensure that they stay in place on aero tubing, and this works really well. The COB LEDs only sit in a portion of the Mini's light face – an inner 12mm square to be precise – with the remaining area a reflective 4mm border, and give an effective output both front and rear, in any of the modes. Despite their small size the Chippys (Chippies?) are sufficient on their own to get you noticed by other road users. They're in Knog's 'Be Seen' range, although the Chippy is also highlighted for 'Peloton' use. The wide beam (120 degrees) offered by the front light is impressive given its small source; lateral lighting is noticeably better than with many other small safety lights. As far as 'peloton' use goes, it was great to use in a group at night, but not without the addition of a much more powerful beam to light up the potholes and road ahead. The Chippy gives out a maximum of 20 lumens and is certainly only designed to get you seen. That wide front beam can also be hindered by gadgets, brackets or clamps that extend from the front of your bar. The light face only sits 13mm away from the bar edge, so it's easy to see why. In fact the rear light could be partially obscured too, so you'd need to give some thought to the mounting position to avoid potential coverage by a long jacket or a sagging/loose saddlebag. It might be that you have an accessory-free bike, in which case, no problem. The lights are easy to switch on and off with a prolonged and audible click, possible with even thicker gloves on, and they incorporate a mode memory feature – turning on in the last mode used. A simple single click cycles through the five different modes – steady, strobe, fading flash, lightning flash and eco flash. Five strikes me as overkill, though it seems most manufacturers are taking the multi-mode route. In steady you can expect the Chippies to last 2 hours, while the longest lasting is eco flash, which will keep going for 11 hours. Although accurate to Knog's claims, these run-times don't match a lot of other lights on the market. They recharge in just 2 hours, though. What's more disappointing is the low-battery warning feature. This is a tiny red light positioned in the reflective border, which lights up when the battery is low. It lights up just five minutes before the battery is empty, which isn't great – but because it's on the light face itself you won't see it while riding. It demands that you look directly at the light – cue disturbing flashing vision for several moments thereafter – and even then it's very difficult to see. If you happen to turn the light off when the battery is almost empty, the LEDs will dim to a red glow, which is a better warning. Quite frankly, the tiny red light is pretty pointless given this latter feature, but even so, five minutes isn't ideal. Overall, if you want convenient, compact and weather-resistant front and rear lights to get you seen on your commute, or to add to your bike as secondary lights while doing winter evening group rides, the Blinder Mini Chippy Twinpack is a good choice. Just make sure you establish a recharging routine so you aren't caught out with a flat battery. Knog says that the Blinder MINI Chippy front and rear lights, featuring Chips on Board technology to give a panel of light, boast surface mounted LEDs offering 20/11 lumens (front/rear) to get you seen from over (800m) away. The Chippy comes with an integrated reflector face for added safety. 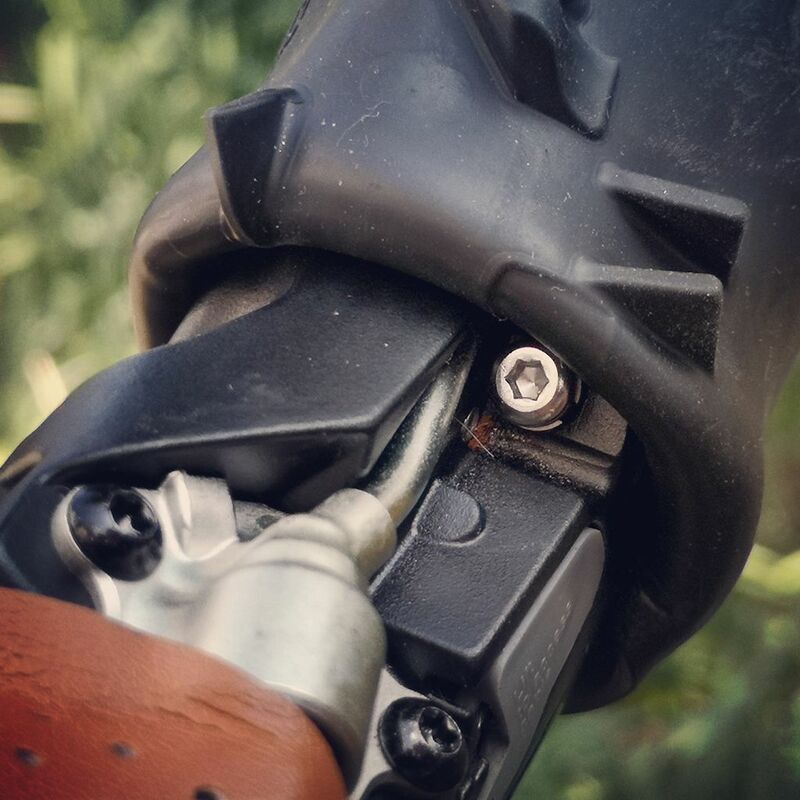 Tool-less attachment securely connects both rear and front lights to handlebars and posts of 22–32+mm, they are designed to fit both standard and oversize handlebars and aero style seatposts. The size and weight of the lights are their most appealing features- a combined weight of 36g and only 31x31x14mm. The Chippy is designed for 'peloton' use according to Knog; the wide angle (120 degrees) offered by the Chippy is ideal for lighting the space around you when riding close to others. However, they do come from the 'be seen' range so don't be fooled into thinking that the front light is sufficient on its own for group riding, it isn't! Both lights are identical in design. The fully sealed units have the USB integrated into the light and different sized silicone straps (two front, three rear) can be interchanged depending on bar/post diameter. Although the charging strip is integrated it is somewhat exposed – it does not tuck away or have any kind of protective cover. The lights are straightforward: prolonged press to switch on and one click to change between modes. A little faffy with thick gloves as the button is so small, but not impossible. The lights are, as would be expected, mini- ideal if you have gadgets or clamps cluttering your front bar or limited seatpost at the rear, though anything too bulky would obscure the beam as the Chippy sits plush to the tubing. Both lights use the same clamping system. Select the correct sized silicone strap and fix it to the light! This is the worst part but necessarily fiddly to ensure a secure attachment. Once you have the strap attached you are unlikely to want to be changing it very often anyway. They are easy to take on and off if you want to remove them when you leave the bike. Excellent – even in a bucket of water! After a rainy commute I would remove the light to simply dry off the USB attachment. Knog also claims that they are dustproof, which isn't surprising as the casing is seamless. If they let you down on this front it's worth noting that Knog offers a two-year warranty. Not a huge battery life in comparison to many lights on the market but they can be recharged without cables, which is handy. The rear light is sufficient on its own to warn other road users of your presence. The front gives a good strong light and wide beam – you'll be seen, but it's not bright enough to highlight potential small hazards in the road surface. The front light is great for lighting the peripheries if riding with others. The low battery warning light is poorly positioned, and doesn't come on early enough. The USB plug position looks susceptible to wear and tear, but Knog claims it is designed to withstand the elements, and offers a two-year warranty. A combined weight of 36g won't hold you back. Extremely handy set of lights for a decent price; both sufficiently bright on their own at night for a street-lit commute. The front doubles up as a super secondary light for evening winter training rides with a group, so all in all, good value. The front light didn't quite have the punch I would have hoped for from a light claiming to be for 'peloton' use. Its wide beam was great for lighting the peripheries though. The striking rear light is ideal. The front light's wide beam feature is hindered if you have a gadget extending off your bars. The low battery warning light. Would you consider buying the lights? As standby/secondary lights, yes. These are fully waterproof, easy to use lights that do a good job of making sure you can be seen from front and rear, and are hard to beat in terms of convenience and simplicity. I would score them an 8, but run-times aren't the longest, and the low battery warning isn't very well designed. The larger version: Blinder mob mr chips is on sale at planet x at the moment for £15 front and £15 rear. Do the reflectors on these count as reflectors? IE can i remove the rubbish looking reflectors from my bike and replace with these and still be road legal? Thanks for the tip - there's a variety of Blinder MOB lights on sale at planet x for £8 and/or £15 depending upon colour and LED configuration, rather than the RRP of £35 ish. I just ordered myself a pair of Blinder MOB Kid Grid 16 LED lights (reviews http://road.cc/content/review/205979-knog-blinder-mob-kid-grid-front-light and http://road.cc/content/review/206819-knog-blinder-mob-v-kid-grid-rear-light) for £8 each, plus £4 delivery. I'm planning on getting a set as a backup set of lights (I like to have a main set which I use, and a second incase they run out of battery/fail). That way when they're off they're still serving a function. Plus they'll be a nice looking set of lights for daytime use on the road bike during the summer too! I saw similar last week and ordered myself front and rear 16LED kid grid lights at £11 each. Prices at Planet X seem a bit kangaroo at the moment. I bought some of these, and on constant the rear light wont even last an hour and a half! Odd. I have one on the front, in slow pulse mode, for extra visibility and it was going strong after a five and a half hour sportive yesterday.